Such is the state of the Chechen War. Declared officially over, though unofficial persists in the form expect for sporadic attacks by Wahhabi militants and hold out nationalists and terror perpetrated by pro-Russian forces. 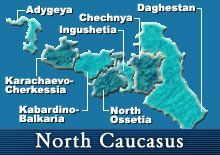 What is really happening is that it is spreading to neighboring Dagestan, North Ossetia, Ingushetia and Kabardino-Balkaria. The Russian puppet, Ramzan Kadyrov, “seems” in control. But the amount of control is in direct proportion to the amount of blood that flows. Neistat’s piece is good timing. It ads some much needed perspective on recent events. A week ago, Russian forces killed Abdul-Khalim Sadulayev, though some feel his death won’t make much of an impact. The new leader of the Chechen separatists, Doku Umarov, recently denounced Shamil Basaev’s use of terrorism (though never directly names him) in an interview with Andrei Babitskii. All of this seems to not have meant much because Umarov turned around and named Basaev vice-president of the separatist government. For the Putin Administration, Chechnya is becoming a political success via Chechenization. Any talk of Moscow’s or its proxy’s brutality by the United States is quickly shot down with pointing out the utter failure in Iraq. Putin has become so emboldened that Nashi spent $400,000 to organize rallies at the UN in New York calling for the extradition of Chechen rebels to Russia. Remaining silent is no guarantee against abuse, however. The members of the anti-terrorism unit are eager to prove their industriousness. ‘When I first joined them,’ a former member of Kadyrov’s security service confided to me, ‘I kept asking: “How are we going to find the rebels or their caches of ammunition?” And they told me it was a “chain”: we go after someone, and “work” with him until he gives us names, and then we follow up, and so on, until someone confesses. Eventually someone always confesses.’ In villages across Chechnya we found evidence of this strategy in action. Young and old, men and women, healthy and disabled: no one is safe from being made a link in the ‘chain’. You don’t have to look very far to find a torture victim in Chechnya. I spoke to dozens. A refusal to confess often results in even worse treatment. Khasan Kh., who is 19, refused to confess or incriminate others. He was tortured for 13 days in a row. He thinks he was held in the basement of the local commander’s house, one of the secret prisons the Kadyrovtsy have established all over Chechnya. In the middle of winter, they kept him in the cellar wearing only his underwear. His captors said they would give him food if he started to talk. Day after day they suspended him by his feet from a tree, and beat him with shovel handles. On the 13th day they told Khasan they were taking him out to execute him, but instead dumped him in the forest, bound and blindfolded. Villagers found him and took him home. His mother fainted when she saw him: he looked like a skeleton, she said. He had an open fracture on his arm and was in the early stages of kidney failure as a result of the beatings. Khasan’s arm is now permanently disfigured: the family was too frightened to take him to hospital. Read on. I implore you.